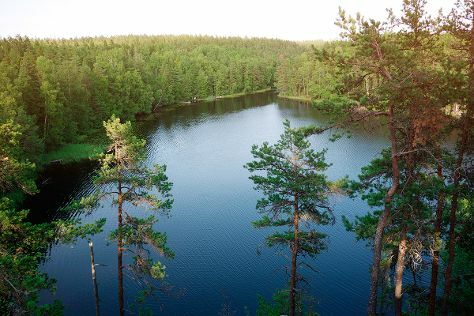 Get outdoors at Nuuksio National Park and Tapiola Golf. There's still lots to do: take a stroll through Katajanokka, contemplate in the serene atmosphere at Kamppi Chapel of Silence, brush up on your military savvy at Sea Fortress Suomenlinna, and relax and rejuvenate at some of the top local wellness centers. To see where to stay, maps, photos, and tourist information, use the Helsinki trip planner. Nottingham, UK to Helsinki is an approximately 8.5-hour flight. You can also do a combination of train and flight; or do a combination of train and flight. The time zone changes from Greenwich Mean Time (GMT) to Eastern European Time (EET), which is usually a 2 hour difference. In October, Helsinki is little chillier than Nottingham - with highs of 10°C and lows of 1°C. Cap off your sightseeing on the 16th (Wed) early enough to catch the train to Tampere. On the 17th (Thu), soothe aching muscles at some of the top local wellness centers and then kick back and relax at Rauhaniemi Beach. For photos, where to stay, reviews, and tourist information, read our Tampere trip tool . Traveling by train from Helsinki to Tampere takes 2 hours. Alternatively, you can drive; or fly. In October, plan for daily highs up to 8°C, and evening lows to 0°C. Wrap up your sightseeing on the 17th (Thu) to allow time to travel back home.